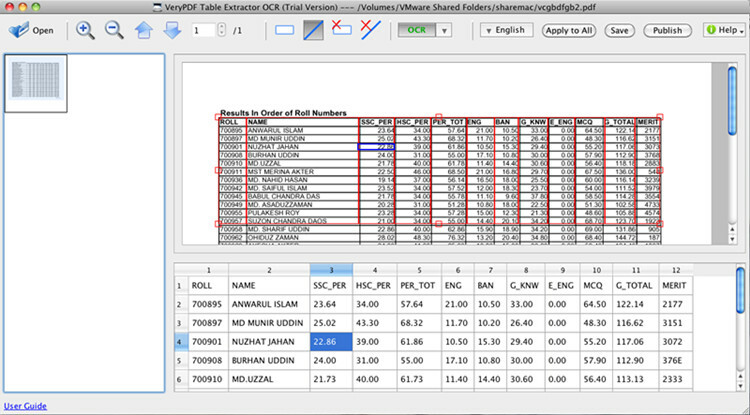 VeryPDF Table Extractor for Mac is designed to extract tables from scanned, normal PDF or image and then recognize characters in PDF or image in different languages with OCR technology. It has the ability to recognize characters from input PDF or image file and then draw table according to your needs in Mac OS X system. Features of VeryPDF Table Extractor for Mac: 1. Support online publishing. 2. Support multiple languages. 3. Input file format: PDF, BMP, JPG, JPEG, JPE and GIF. 4. Output file format: CSV, XLS, HTML, PPTX, DOCX, XLSX, RTF and TXT. 5. Apply the rule for the present page to all the rest pages. 6. Allow to preview and compare the original tables with the result tables. 7. Highlight the corresponding original text when click on the text on the main interface. 8. Automatically deskew the input file when the skewed angle is less that 15 degree. 9. Rotate input files by different degrees. Table extractor OCR Mac OS X PDF to HTML PDF to TXT PDF to XLS PDF to DOCX PDF to RTF PDF to PPTX PDF tool. This site does not contain serial number, crack, keygen VeryPDF Table Extractor for Mac serial number : serial number is the simplest type of crack. A serial number(cdkey,product key,etc) is register the program as you may already know. a crack or keygen may contain harmful software. If you cannot find the exact version you want, just give it a try. for more information read .nfo/.txt/.diz file include in zipped file.